I loved The Year of the Rat when I read it last year, so was really pleased to find Furniss’s second novel in the library. I hoped it would be as good as her first – but in actual fact it was even better! Hattie is 17, fed up as her friends have gone off travelling, and also – annoyingly – pregnant by a boy that everyone warned her was trouble. Then, to make matters worse, her mum goes off on holiday with her fiancée and Hattie’s twin siblings. So now she’s really on her own. What she really needs is a new friend – and she gets one, in the most unlikely shape of her alcoholic great-aunt Gloria, who is not only eccentric and usually smashed, but was also shunned by her family (or did she shun them? ), oh – and is also suffering from the early stages of dementia. Do any of these things stop Hattie setting of on a road trip across England with her? Nope! 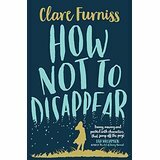 This book manages to combine humour, sadness, teen pregnancy, dementia, racism, a bit of romance and family drama into one package, which could have gone horribly wrong, but instead works beautifully well. Firstly, we have Hattie who is witty and has quite an adult voice at times, but is also still obviously young and naïve in many ways. I loved her sister Alice with her pretensions to become a spy, and Alice’s twin brother Ollie who is sweet and sensitive. I also liked the fact that for once, the step-father really was the book’s good guy! But it is Gloria who really makes the book shine. She is grumpy, rude and – usually – drunk, but she is also wise and utterly hilarious. Throughout the book we have shorter chapters telling us Gloria’s story and these worked brilliantly for me. They were short enough not to take away from the main story, but they also gave an insight into another world, which I think is quite rare in a lot of YA fiction, which tends to focus all its attentions on the younger generation. I absolutely loved this novel and really can’t find fault with it. It made me laugh and cry, and the characters will stay with me for a long time. Just perfect! Great review! I need to start reading more YA. It’s not my usual genre but I know there are a lot of great YA books out there and I need to get out of my comfort zone. This book looks like a great place to start. It’s definitely a genre I’ve got into more and more – there is so much amazing stuff out there and I enjoy a lot of the books just as much as “grown-up” ones. Let me know if you give it a try! I have this book waiting in my TBR pile so it’s really great to hear you loved it! Great review!